Poor Jar Jar, not only is he one of the most misunderstood characters in cinema history (both by audiences and in universe) but he also has to live with the knowledge that he was instrumental in the downfall of the Republic and the rise of the Empire. That has to get to a guy. Jar Jar's, shall we say, lack of popularity means it's likely we'll never see him on screen again. However, we will be finding out what happened to the poor Gungan in the upcoming novel Star Wars Aftermath: Empire's End by Chuck Wendig. The novel, which is set following the events of Return of the Jedi, will revisit the Gungan on Naboo and reveal what he's up to in this time period. It seems unlikely that Jar Jar will factor into the story in a meaningful way. Wendig's Star Wars novels include frequent interludes that check in on other places in the galaxy so we can see what's going on there during the main story. This likely means we'll see a Naboo interlude, where we'll finally find out what happened to Jar Jar (and no, he's not Snoke). 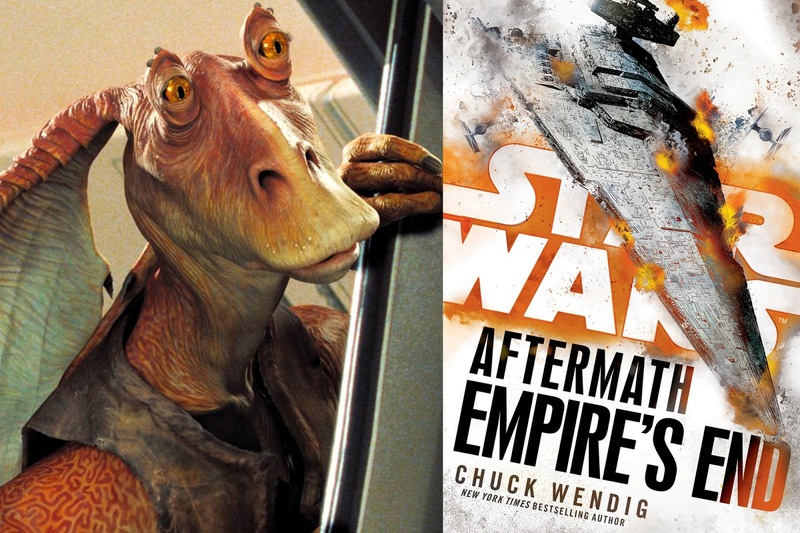 Following Star Wars: Aftermath and Star Wars: Life Debt, Chuck Wendig delivers the exhilarating conclusion to the New York Times bestselling trilogy set in the years between Return of the Jedi and The Force Awakens.